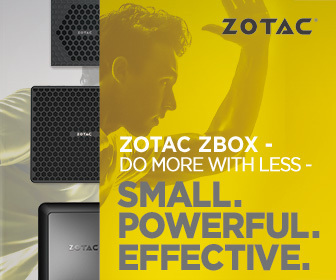 ZOTAC Technology, a global manufacturer of innovation, today releases a new generation of MAGNUS E Series Mini PC built for hardware enthusiasts. The MAGNUS is re-engineered to give powerful performance for creators and prosumers in a compact and lightweight enclosure. With an 8th Generation Intel® processor, a discrete GeForce RTXTM 2070 graphics card and equipped with premium connectivity, the all-new MAGNUS E Series Mini PC powers everything from demanding workloads, creative workflows, home entertainment experiences, and much more. The MAGNUS EC52070D features a 6-core Intel® CoreTM i5-8400T processor with boost up to 3.3GHz, giving it the power to handle simultaneous, compute-intensive, multithreaded workloads. Users can get responsive processing on creative workflows such as photo post- processing, illustration, audio processing, video production, live-streaming, and more. With ready support for up to 32GB of high-speed DDR4 memory, NVMe M.2 SSD, 2.5-inch large capacity storage and Intel® OptaneTM memory technology for high performance storage, MAGNUS is capable of loading files and applications faster. The new MAGNUS taps into the power of NVIDIA’s latest GPU based on the NVIDIA TuringTM architecture for the first time. Inside the small system is a desktop-sized ZOTAC GAMING GeForce RTXTM 2070 graphics card to bring more performance and support for newer technologies including real-time ray-tracing and DLSS. MAGNUS allows convenient customization or upgrades to hardware with tool-less access to SO-DIMM memory slots, M.2 SSD, Intel Optane Memory, and 2.5” HDD/SSD bay for simple expansion. Available in Barebones configuration or Windows configuration with memory, storage and Windows 10 Home pre-installed.